China and Kyrgyzstan on Wednesday agreed to establish a comprehensive strategic partnership. 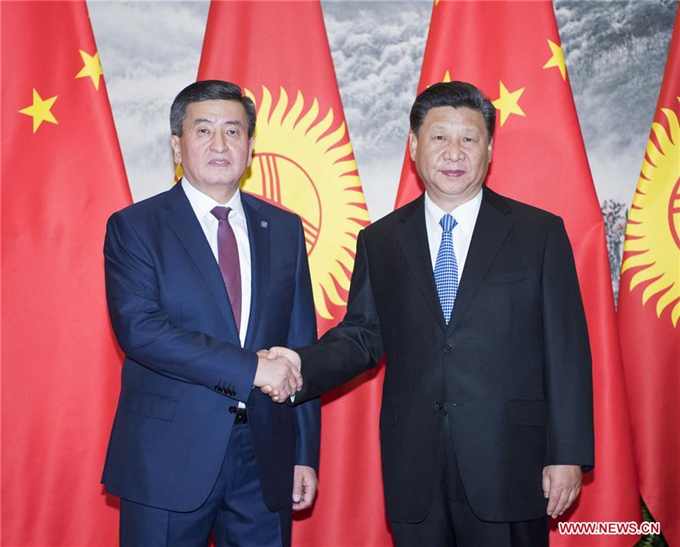 The agreement was reached during the talks between Chinese President Xi Jinping and visiting Kyrgyz President Sooronbay Jeenbekov at the Great Hall of the People in Beijing. "It is another landmark event in the history of bilateral ties that China and Kyrgyzstan will establish a comprehensive strategic partnership, which will inject new impetus into the development of bilateral ties," Xi told Jeenbekov. Standing at a new starting point, China is willing to work with Kyrgyzstan to carry forward the traditional friendship and conduct all-round cooperation so as to achieve national development and better benefit the two peoples, said Xi. Noting that Kyrgyzstan was one of the first countries to support and participate into the Belt and Road Initiative and related construction, Xi said China would like to make joint efforts with Kyrgyzstan to open minds and explore potentials to lift bilateral cooperation to a new level. He called on both sides to enhance synergy in development strategies and policy coordination, seek more converging interests and growth points, jointly plan key areas and major projects, expand trade and investment, and speed up construction of major projects. Both countries should expand cultural and people-to-people exchanges and local cooperation to boost neighborly friendship, said Xi, who also stressed the importance of improving security cooperation to fight the "three evil forces" of terrorism, extremism and separatism and organized crime across the border. Xi spoke highly of Kyrgyzstan's support for China since it has taken the rotating presidency of the Shanghai Cooperation Organization (SCO) last June, saying that China stands ready to work with Kyrgyzstan to promote the SCO so it can develop along a healthy and stable track. Jeenbekov, who is in China on a state visit and to attend the SCO Qingdao Summit scheduled to be held this weekend, said Kyrgyzstan admires China's social and economic achievements and appreciates China's long-term valuable assistance. The establishment of a comprehensive strategic partnership unveils a new chapter in the bilateral relationship, he said. Jeenbekov said it has always been Kyrgyzstan's priority to develop ties with China and Kyrgyzstan has been and will continue to be a most reliable neighbor, partner, and friend of China. Kyrgyzstan will firmly adhere to the one-China policy, stand ready to advance pragmatic cooperation with China in the areas of economy and trade, cultural and people-to-people exchanges, and jointly combat "three evil forces," as well as work together in safeguarding regional peace, stability and security, said Jeenbekov. Kyrgyzstan backs the China-proposed Belt and Road Initiative and believes the initiative will greatly promote common development in the region, said the Kyrgyz president, adding that Kyrgyzstan will maintain the continuity of all cooperative agreements with China. Jeenbekov said his country is confident that the SCO Qingdao Summit will be a success under the leadership of China. After the talks, the two presidents signed a joint statement regarding establishing a comprehensive strategic partnership between China and Kyrgyzstan and witnessed the signing of a series of cooperative agreements. In the statement, both sides reiterated that they would not join any union or group that harms the other country's sovereignty, security and territorial integrity and would not sign such treaties with a third country. Both sides agreed not to allow a third country, organizations, groups or personnel to conduct activities jeopardizing the other country's sovereignty, security and territorial integrity. In line with the principle of mutual respect, equality and mutual benefit, and win-win cooperation, both sides agreed to carry out the cooperation documents and programs that have been signed or agreed upon, and to promote bilateral, multilateral trade and economic cooperation projects, including highways and railways, energy, fiber-optic communication lines and mining industry to inject new contents into a sustainable cooperation between the two countries, the statement said. Both sides agreed that pragmatic cooperation is the material basis of the comprehensive strategic partnership between the two countries. They reiterated their opposition to all forms of protectionism and agreed to facilitate trade and mutual investment. While recognizing the importance of enhancing interconnectivity of regional transport infrastructure, both sides pledged to continue to work for building an efficient transport corridor connecting the two countries and linking to other nations in the region. To expand cooperation in law enforcement, strengthen exchanges between departments, enhance intelligence sharing and improve border security cooperation, both sides agreed to make joint efforts in fighting the "three evil forces" including the East Turkistan Islamic Movement, international terrorist organizations, money laundering, drug smuggling, and cyber crime, as well as all forms of organized crime across the border, to safeguard peace, security and stability of the two countries and the region. The two countries also agreed to enhance cooperation under the framework of the United Nations, the Shanghai Cooperation Organization, and the Conference on Interaction and Confidence-Building Measures in Asia so as to exchange opinions on major international and regional issues in time, jointly rise to global and regional challenges, safeguard the common interests of the two countries, and continue to strengthen collaboration in initiatives that conform with common interests of the two sides, the statement said. Prior to the talks, Xi held a welcome ceremony for Jeenbekov outside the East Gate of the Great Hall of the People. According to the Chinese Foreign Ministry, this is the first time the new state visit welcome ceremony has been conducted.